The Oakland Symphony has been a community institution in the Oakland area for several decades. However, they know that in order to remain relevant in the coming decades, the Symphony must attract more Millennials to their symphony performances. I collaborated with 2 UX Designers. My role was to conduct research, analyze data, and ideate design solutions. Afterwards, I worked independently to build higher fidelity wireframes, create a working prototype, and explore the visual design of the product. "None of my friends go to the symphony." One of the biggest challenges facing Oakland Symphony is that Millennials very rarely consider the Symphony as a viable or appealing social plan. Survey data showed early on that Millennials feel this way as a result of many factors: disinterest in classical music, perception of high ticket prices, and the fact that not many of their social networks were also attending the symphony. Curated events + group discounted tickets through invitations. By having more appealing events to Millennials, the symphony can attract and retain younger users. A digital portal allows folks to browse concerts, create events, & invite their friends at group discount prices. Follow the millennials and ask 'why'. DON'T BE AFRAID TO PROVE YOURSELF WRONG. Throughout the process, I made sure to revisit the hypothesis. Initially, the hypothesis was that Millennials did not go to the symphony because they were not exposed to it. However, as research taught us more about users, the hypothesis continued to evolve. We learned instead that Millennials are open to going to the symphony, but only if it had certain appealing factors, like the ability to socialize or drink. Not only did we want to understand why Millennials currently did NOT go to the symphony, we wanted to understand why they went to the events that they DID go to. What made those events appealing or preferable? What factors motivated our Millennials to commit to certain events? What elements made those events memorable and encouraged repeat attendance? I created a survey and user interview framework that helped to dig deep and go beyond the Oakland Symphony. BE INSPIRED BY WHAT YOU'RE UP AGAINST. We wanted to understand what other symphony orchestras and cultural institutions in and outside of the classical musical space were doing to attract Millennials as well. We learned that competitors offer discounts, curated events with experimental music and exhibits, DJ sets, drinks, small bites, and an "exclusive afterparty". Similarly, organizations in the comparative space also use robust branding and social media presences to create engaging and meaningful dialogue with Millennials. UNDERSTAND THE SYMPHONY'S VALUES, THEN BUILD THE BRAND/PRODUCT. The organization's needs to build and strengthen it's community. We weren't afraid to get messy. The initial research phases were full of rough sketches, white-boarding, sticky-noting, and research. Later on, while more sleek and defined, the solutions continued to be iterated and re-designed, time and time again. I made sure to test our ideas and designs with my peers and target users and distilling all the insights into the next iteration of designs. After speaking to almost 100 people in our research phase, my team and I were able to define three major User Personas to guide our design strategy. 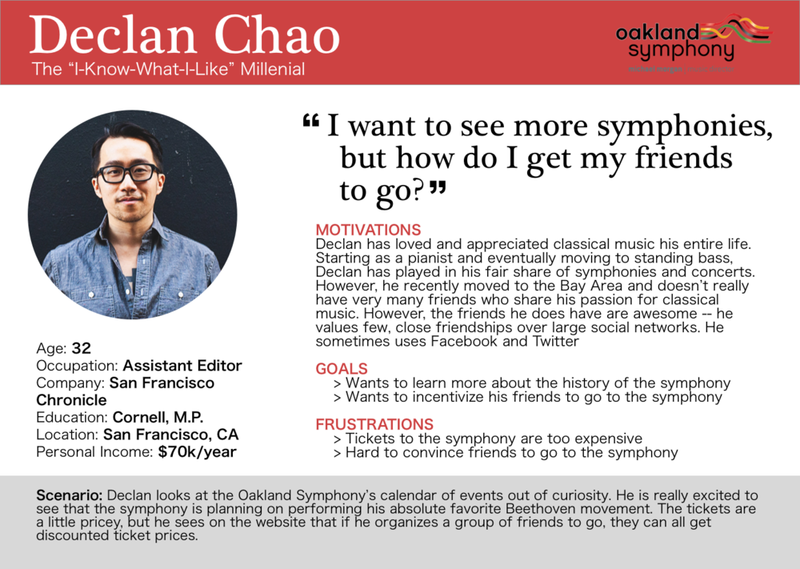 Upon defining these personas, we realized that we could create specific events that were curated specially for Millennials, while remaining true to the Oakland Symphony brand. One idea I propose is an outdoor event called"Symphony in the Garden". To make it accessible to the community, the event is free, with symphony music playing or projecting in the background. The Symphony can sell food and drink to generate revenue, but ultimately, the event allows everyone, especially Millennials with limited purchasing power, to come and enjoy good music in good company. However, in order to gain traction in the community, Oakland Symphony needs to revamp it's Digital Marketing and Social Media Strategy. One major insight found was that most Millennials find events through either Facebook or word of mouth. Therefore, it is very important to emphasize these channels of engagement in a targeted campaign. This portal allows individuals to easily organize groups and invite friends to attend a symphony performance together in a group while gaining access to discounted group tickets. It is "Kickstarter meets Facebook"; individuals have 48 hours to invite their friends and reserve group seats through a digital portal. At the end of that 48 hours, everyone who has committed is then charged. The more people join the group, the deeper the discount, thereby incentivizing organizers and friends to invite more friends to attend. I continued on to create higher fidelity wireframes and a working prototype. Currently, the Oakland Symphony's online brand is very colorful, bold, and playful. However, most of my research showed that it did not feel current, modern, relatable, or fun -- all factors that heavily influence Millennials when they are evaluating a new brand. For the next 4 days, I independently built out the UI of the initial prototype, conducted usability tests, and revamped the Oakland Symphony's brand and visual design. I wanted to maintain Oakland Symphony's core values of building community and showcasing beautiful music throughout my design. However, I aimed to reduce visual noise and maintain a much more simple, minimal, elegant, and current brand. Initial research suggests this design will delight both current and potential users, but will require more usability testing to confirm. This is the Homepage (Desktop version) of the Oakland Symphony with visual design elements applied. Focus on long-term gains, not short-term gimmicks. Fundamentally, your typical "Millennial" and the Oakland Symphony don't mix. Symphony Orchestra performances are too passive, too traditional, and too un-engaging to a user who is used to having the constant stimulation of the Internet at their fingertips. The question is not "How do we get Millennials to like classical music? ", but rather, "How do we make the Symphony attractive to Millennials?" The short answer? Make it affordable. Provide booze. But that's no better than a gimmick. Our solution takes a much more comprehensive and holistic look on things. First, create appealing and affordable events. Second, market them on social media channels used by Millennials. And third, make it easy for Millennials to invite their friends. Now we can attract new users and create experiences that are memorable enough for return visits.